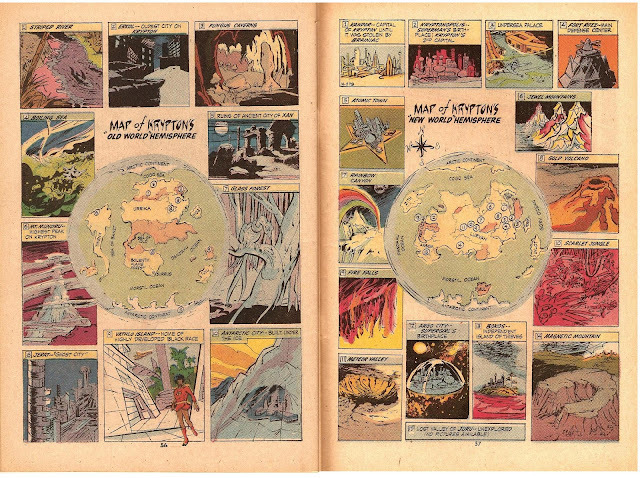 A few days ago, Jeff Shyluk and I were poring over maps of Krypton as part of a project we've been discussing. I came across this old map of Krypton, and we exchanged some wry, sad commentary about "Vathlo Island--Home of Highly Developed Black Race." "It makes you wonder what happened to the Kryptonian East Asians, Indigenous peoples, South Asians, etc. You know, over the years I have read nearly every issue of Superman, Action Comics, Justice League of America, World's Finest, Superman Family, Supergirl, Super-Team Family, DC Comics Presents, The Legion of Super-Heroes, Adventure Comics, Super-Sons, Superman's Girlfriend Lois Lane, Superman's Pal Jimmy Olsen, Superwoman, Superman Confidential, and the various one-shots, miniseries, and novels that make up the Superman canon. And in all those hundreds of comics and stories, I can think of only one non-white Kryptonian, Val-Zod, and he didn't show up until 2011, plus he's from a parallel Krypton, no less (from the universe of Earth-2, which I guess means he's from Krypton-2, though not the same Krypton-2 that birthed the original Golden Age Superman...never mind, comic book continuity is utterly ridiculous). It's possible that there may have been non-white Kryptonians depicted in background scenes during flashbacks to Krypton pre-cataclysm, or maybe we might have seen a black or Asian Kryptonian in the bottle city of Kandor. But wow, until this email I had honestly never even considered the crazy fact that Krypton, aside from that one map reference and the very recent Val-Zod introduction, has been portrayed as an entirely white culture. WOW. That is bananas." Edited to add: Thanks to Mike Totman for digging up this 2009 story that reveals there have indeed been some non-white Kryptonians featured in the recent past.